When I was born, my family lived in a very friendly neighborhood in Houston, Texas, where everybody knew everybody else. Our next door neighbors were both widowed little old ladies who were home all day and were like the grandmothers I didn’t have. It was a really great place and time to be a kid. We played outside all day with no worries about safety because the neighbors were very watchful. Of course, when I was a teenager, that became a little less desirable, since it was impossible to misbehave without being ratted out by one of the little old ladies! But I digress…. My father died in October of 1952. I was almost six years old. Our street was two blocks from a neighborhood commercial street with a local grocery store, a “five and dime”, a hardware store, drug store, etc. All the store proprietors knew the locals, and many lived in the neighborhood. That year, Christmas was a little tough for our family. I wanted to get my mother a gift, but at the age of six I obviously had little money to spend. It wasn’t unusual then for a six-year-old to be out and about alone in the neighborhood, so I walked the two blocks to Shearer’s Drug Store and found a beautiful costume jewelry pin that I really wanted to buy for Mom. I took it to the counter and asked the cashier how much it was and if I could buy it for Mom. She called Mr. Shearer to the cash register, where I had emptied my pockets of all my quarters, nickels, and dimes onto the counter. He carefully counted all the change and announced that I had JUST enough to buy the pin — with a nickel left over for a Coke from the Coke machine! I was so excited! I left with the pin, gift wrapped and everything! I could barely contain myself and keep my secret until Christmas. Of course Mom loved the pin. I have tears in my eyes today just writing of this incredible kindness and generosity — to help a young boy buy his widowed mom a Christmas gift. 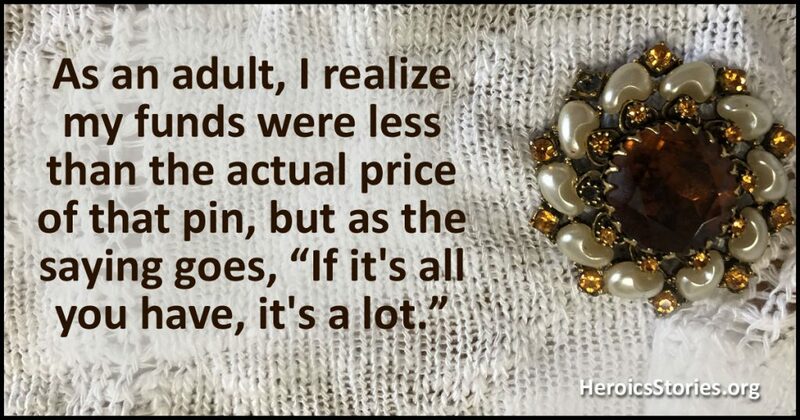 As an adult, I realize my funds were less than the actual price of that pin, but as the saying goes, “If it’s all you have, it’s a lot,” and Mr. Shearer understood that. I can never thank him enough. A beautiful loving story about a man who cared more about helping a young boy display his love for his mom then about “making a profit”. Fortunately, this type of story is played out many times around the country. This gives me HOPE that there are still caring adults willing to help out. I really liked a particular story of an unfortunate lady who found she was short of cash to play her grocery bill. The man behind her pretended to “find a $5 bill she had dropped on the floor”………of course he had put it there! Keep up the stories. They are “candle in the darkness” we currently inhabit. What an incredibly generous man. That certainly would not happen in today’s world. Tears in my eyes, too.